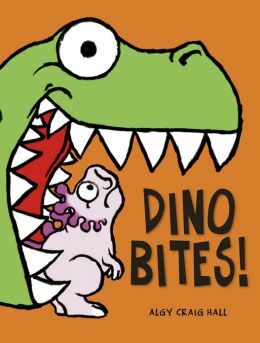 Scholastic have just released two great new dinosaur picture books for the young dinosaur fan in your life, Dino Bites! by Algy Craig Hall and Dinosaurs in the Supermarket by Timothy Knapman and Sarah Warburton. Dino Bites! by Algy Craig Hall is like a dinosaur version of There Was an Old Woman Who Swallowed a Fly. It starts with ‘This is the dinosaur looking for lunch. This is the lunch looking for a snack…’ and continues on with smaller dinosaurs each time, all looking for something to eat. However, their food is still buzzing and wriggling inside their tummies and with one big BURP everything is back in order. The story is simple enough for even the smallest dinosaur fan to enjoy and the illustrations are appealing because they’re bright and bold. The front cover is sure to jump out at children, with the big T-Rex with its mouth open wide. 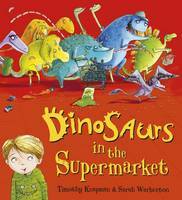 Dinosaurs in the Supermarket by Timothy Knapman and Sarah Warburton will appeal to dinosaur fans young and old. I’m sure it’s almost every kid’s fantasy to meet an actual dinosaur, but what would happen if you went shopping with your mum and dinosaurs were everywhere? The boy in the story sees a ‘T-Rex gobbling sausages…Stegosaurus spilling beans…and Apatosaurs chucking frozen peas,’ but when he tries to show his mum, the dinosaurs hide. It’s not long before the dinosaurs have created a huge mess, but the boy gets the dinosaurs to play a game of Supermarket Clean-up. Dinosaur fans will recognise their favourite types of dinosaurs in the story and will have fun trying to find the dinosaurs in their hiding places. The rhyming text is fun to read and the illustrations will have kids in stitches. Sarah Warburton has obviously had a lot of fun creating havoc with her dinosaurs on the page and making a huge mess of the supermarket. It’s always exciting to discover new dinosaur books because they’re always so popular with young readers. I highly recommend both of these picture books and I know they will have children laughing (and roaring) along with the story.